BitifEye offers a broad range of test accessories which complement Keysight test instruments and software. Keysight instruments, BitifEye’s test accessories and the N5990A/ValiFrame test automation software platform are standard products which easily add up to highly integrated and automated, application-specific test systems. BitifEye’s test accessories simplify and fasten the test execution and ensure a high level of test confidence. 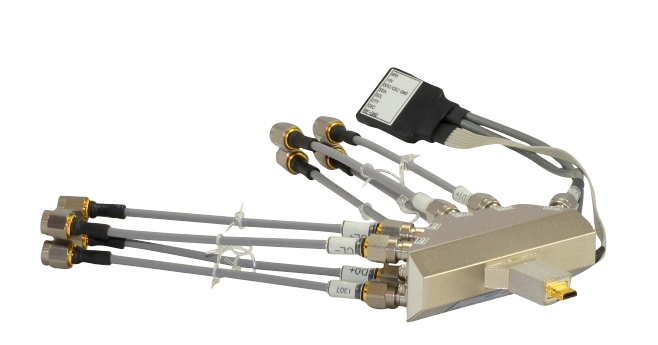 Application-specific test accessories are available for DisplayPort, HDMI, MHL, MIPI, SAS, SATA, SD™, SFP+, QSFP+, EEE, RJ45, Fibre Channel, Thunderbolt, USB, uSSD und PCI Express. General Purpose test accessories can be used for multiple applications. DiiVA Accessories are available on request. In case you need special test accessories, feel free to contact us with your specific needs. Different sets of high quality test fixtures for e.g. HDMI (photo), USB, DisplayPort…..
Full USB Test fixture kits including calibration boards are available for Type C, USB 3.1 Gen1 and Gen2, USB 3.0 and also USB 2.0 Cable and Connector Tests. Useful for every kind of application in order to minimize wear of the instrument connectors. Available as specific kits for the support of a specific application or as single units.